Doug’s Archaeology is at it again, with a one-month blog carnival! Expanding on a survey of archaeologists done a few years ago (see article here), Doug asks us: What are the grand challenges facing YOUR archaeology? He gives us leave to decide how we want to define “our” archaeology. My archaeology occurs in the Arctic. In my mind, the biggest current and continuing challenge of archaeology is climate change. This is a topic that is (finally) starting to get more attention from the greater community of professionals, scientists, and funding agencies. Although warming temperatures have allowed for some amazing finds via surveys of melting ice patches (for example, see this article), the negative effects of climate change on archaeological sites in the Arctic far outweigh the good. These effects come in the form of coastal erosion due increasing storm severity, deterioration thanks to The Great Unthaw of permafrost, flooding from increased precipitation, etc. This has been addressed on other blogs, such as Anne Jensen’s Out of Ice and Time (here) and Shelby Anderson’s blog (here). And publications discussing the issue include Hans Blankholm’s 2009 article on research and CRM strategies in response to climate change in Arctic, Subarctic, and Subantarctic regions; Pauline Goetz’ 2010 MA Thesis, Preserving Arctic Archaeology in the 21st Century: Threats of Climate Change; Kieran Westley et al’s 2011 article on impact of sea level change on coastal sites in Newfoundland; and Max Friesen et al’s 2015 report on their Arctic Cultural Heritage at Risk (Arctic CHAR) project. Even though it’s coastal erosion we have to thank for the discovery of Zhenya the 45,000 year old butchered Siberian mammoth, I shudder to think how many comparable sites and specimens from coasts across the Arctic have already been lost. Sites across the circumpolar Arctic are being actively destroyed by climate change, such as Ukkuqsi (see here for a video of active erosion at this site), Walakpa, and Nunalleq. Federal agencies are only just beginning to respond to the ever-growing threat to these irreplaceable cultural resources. The National Park Service is sponsoring projects like the Climate Change and Archaeology in Northwest Alaska: Nuluk Study (you can read a brief overview here), and the U. S. Army Corps of Engineers – Alaska District put out a study titled “Archaeological Survey of the Mid-Beaufort Sea Coast: An Examination of the Impacts of Coastal Changes on Cultural Resources” in 2012. Thankfully, the National Science Foundation’s Arctic Social Sciences program is starting to fund a growing number of projects at sites under threat from climate change through their small “RAPID” grant, such as the “Emergency Excavation of Eroding Structure, Walakpa, Alaska” (here) and “Mitigation of Threatened Cultural Resources at the Shaktoolik Airport Site” (here). My archaeology also occurs in the exalted (and white-washed) halls of academia. As a PhD student, it seems like the biggest challenge facing new archaeologists is that of finding employment upon graduation, especially if they wish to remain in academia. Many of my friends, now members of the vaunted “Doctor” crowd, are working as Adjunct Professors at community colleges for little money, no benefits, and no job security. At one such Anthropology Department, the adjuncts outnumber the full-time professors 3:1. (For an eye-opening look at the plight of adjuncts, read this and this). According the the Bureau of Labor Statistics’ 2014 data (which doesn’t include 13 states), there are 7,040 anthropologists/archaeologists in non-academic positions, and 6,100 anthropologists/archaeologists in academic jobs. They predict that “prospective anthropologists and archeologists will likely face strong competition for jobs because of the small number of positions relative to applicants.” The National Science Foundation reported that 527 Anthropology PhDs were awarded in 2014. According to their data, only 44.8% had “job commitments” upon graduation – and 40.3% of those were in the form of postdocs. There is a reason that hashtags like #FastForFaculty, #AltAc, and #GradSchoolProblems have gained popularity. Graduate school is difficult enough without worrying about the vanishingly small number of permanent academic positions available after all that hard work and emotional trauma. The Academic Fight Club mentality is as applicable to Anthropology as it is to STEM disciplines. After obtaining an MA at one institution and completing almost four years of a PhD program at another, I have decided that the joy of teaching students is not worth the stress (and destitution) associated with an adjunct or postdoc position. Although I plan on eventually finishing my dissertation, I will be happily running back to a permanent job in federal CRM this March! I encourage you to check out all of the other blogs that are participating in the Grand Challenge Blog Carnival, and to participate yourself if you are interested. Also, if you’re on Twitter please use #blogarch when discussing the blog carnival or blogging session! It’s that time of year again! The Alaska Consortium of Zooarchaeologists will be holding its annual Workshop at the Alaska Anthropological Association’s Meeting in Sitka, Alaska on Wednesday, March 2nd, 2016. This year the guest speaker is Dr. Douglas Causey, Professor of Biological Studies at the University of Alaska Anchorage. Dr. Causey will be presenting on the identification of Arctic bird species. NPR Weekend Edition interviewed him last fall about seabirds and global warming. -Winker et al. 2002. The Birds of St. Matthew Island, Bering Sea. SAA Blog Carnival: Where Will Blogging take Archaeology in the Future? This post is my belated attempt to participate in the final month of the Blogging Carnival hosted by Doug over at the renowned Doug’s Archaeology Blog. Although my carnival posts only add up to a pitifully small number (2), I have been enjoying myself immensely reading all of the fantastic posts by other bloggers! At the very least, this carnival has introduced me to some pretty wonderful sites – my “Blogs I Follow” list has practically tripled. The question to answer this month has to do with where archaeology blogging is heading… what our goals are for our own blogs in particular or archaeology blogging in general. And, most importantly, the direction that we hope blogging is going to take the discipline. Throughout this carnival, my eyes have been opened to all of the different ways people discuss archaeology and anthropology on their blogs. For some, their blog is a blatant and acknowledged soap box; for others, it’s a way to get the general public interested in a specific project. For many, however, it’s simply a way to talk to the anonymous masses of the internet about a topic important to them. Most of the blogs I’ve read are somehow specialized; they focus on certain topics such as bioarchaeology, looting, museum practices, or a geographic region, etc. My own blog is specialized by both method (zooarchaeology and ethnobiology) and geographic region (Arctic… mostly Alaska). And I’ve come to realize that I don’t write for the general public. My pages (and the small number of posts that I’ve actually written) are geared towards notifying other zooarchaeologists of potentially-hard-to-find-but-useful resources. And in retrospect, this was my goal when I started blogging. After reading so many other archaeologists’ blogs over the last several months, I’ve come to appreciate how great a medium blogging is for public outreach. As we become more inexorably linked to the internet (it still amazes me to think how far computers, tablets, and cellphones have come since I was a child! ), the public, our students, and our colleagues are going to be looking for (and expecting) a quick and easy way to catch up on archaeological news without plowing through dense journal articles. The importance of visibility and accessibility (read: less jargon, more photos) for archaeological projects is just going to increase. We’ve all experienced how this trend is already being pushed by granting agencies; the expectation of ‘connectedness’ is rampant in all aspects of our lives. I believe that blogging will become an increasingly popular media in the future. I’m incredibly glad to see how well archaeologists around the world are already utilizing the format to get information out into the blogosphere. I hope that, as a discipline, we will soon be sharing our data online as freely as we do our opinions and news blurbs. For me personally… I think it may be time to revamp my blog. And maybe (if we get funding this season…knock on wood), I’ll create one about our project site specifically geared towards the public. There are so many good examples of archaeology blogs already out there to emulate! It always amuses me to remember that I became interested in archaeology in large part because I was pointedly disinterested in modern technologies… and yet here we are, using those same modern technologies to preserve and promulgate knowledge of the past. The Good – For me, the best part about blogging is sharing information with the public and other archaeologists. Some of the things I most appreciate about other people’s blogs are stories and photos of their work. It seems that most people blog because they’re excited about what they do, and that enthusiasm is translated easily over the blog format, which allows us to post photos and links as well as words. And although many of us also post photos of our field or lab work on other types of social media, blogging allows us to reach people other than our Facebook friends. For me, blogging is a (slightly) more professional outlet where I can express my ideas and concerns about anthropology in general and my research in particular, and I don’t have to worry about old high school friends or my second cousin pestering me about it, or complaining that I take up too much of their news feed. I also love it when people list suggestions for hard-to-find articles or books on their blogs. This is something that I do on this blog, and I hope it is as useful to others as I find it to be. Reading blogs allows me to keep up with certain aspects of anthropology and archaeology that I wouldn’t, otherwise! None of us have the time (or access) to read all of the new articles and books that come out every month. Many blogs that I follow post reviews of books, or discuss new research or recent events. This is incredibly useful, and something that I hope to do more of in the future. The Bad – The worst part about blogging is the time it takes. I don’t post very often, and I wish I did. Despite my best intentions, I’ve found it difficult to set aside the time I need to research and write a post. As mentioned in previous posts, I have a list (which keeps getting longer) of topics that I would like to blog about… I just haven’t done it yet! I often end up avoiding my blog all together, because it frustrates me that I’m not more prolific. Blogging, no matter how ‘professional’ you intend to be, is personal. I often don’t end up posting something because I’m not satisfied with the quality of writing. We don’t have anonymous reviewers or editors that can check our posts for us. It’s worse when you’re blogging for an actual organization or department. I’m currently writing for the Arctic Anthropology blog, which is a lot of fun, but it takes me a ridiculous amount of time to write the posts. There is a tricky line to toe – to be neutral and professional while still being interesting. In today’s world of Buzzfeed headlines and Facebook polls on the news, this is more difficult than you might think! All I know is, is that I can whip out a 1500-word essay in half the time it takes me to write a 500-word blog post. and that’s just silly. The Ugly – I haven’t had an ugly experience with blogging yet (knock on wood!). The worst thing that’s happened so far was someone whose website I had listed under a certain subject heading contacted me and asked for it to be moved under a more appropriate heading… completely reasonable and an easy fix. I’m not sure if it’s because I’ve avoided talking about controversial subjects (I definitely find myself staying away from topics that encourage me to I break out my soapbox), or because Arctic zooarchaeology and ethnobiology isn’t very interesting to most people out there in the InterWeb, but my experience blogging (and reading blogs) has thankfully stayed away from the ugly side of things! On that happy note, I’ll conclude this post. I encourage you to check out all of the other blogs that are participating in the SAA Blog Carnival, and to participate yourself if you are interested! Also, if you’re on Twitter please use #blogarch when discussing the blog carnival or blogging session! Following the suggestion of one of my readers (who has her own great blog at http://bonesandskulls.co.uk/), today’s post is going to be about processing comparative skeletal specimens. I won’t go into the different ways one can obtain dead animals, or any of the state, federal, or international laws governing the acquisition of certain species (but please do look into those before collecting anything!). Today it’s all about decomposition. There are numerous methods one can use to clean a skeleton (and by “clean” I mean get rid of all the smelly, nasty, soft stuff). Which one you use will depend on a number of things including local climate, available space, and time constraints. Cold water maceration is simple – you place the specimen in a tub of cold or room-temperature water, put a lid or screen over it, and walk away. You can do things like wrap pantyhose around the extremities to keep podials, metapodials and phalanges together (which makes it easy to determine whether they came from the left or right side once you’re all done). You can also add a little borax-based detergent booster (I prefer Biz), which will help speed things along. Overall, though, you’re looking at a few months to a year (depending on species) of processing time. Usually people change out the water every week or so, and at the end you obviously want to rinse the (now disarticulated) elements off very well. This method works wonderfully for things with really delicate bones (e.g., birds, fish, skulls), and you’ll avoid any potential shrinking or warping. But beware the fish – the only time I’ve come close to vomiting during processing was after the cold maceration of a burbot. This is probably one of the most common processing methods. You place the specimen in a large pot or glass beaker full of water, and heat it until it is almost boiling (do NOT bring it to a full boil!). 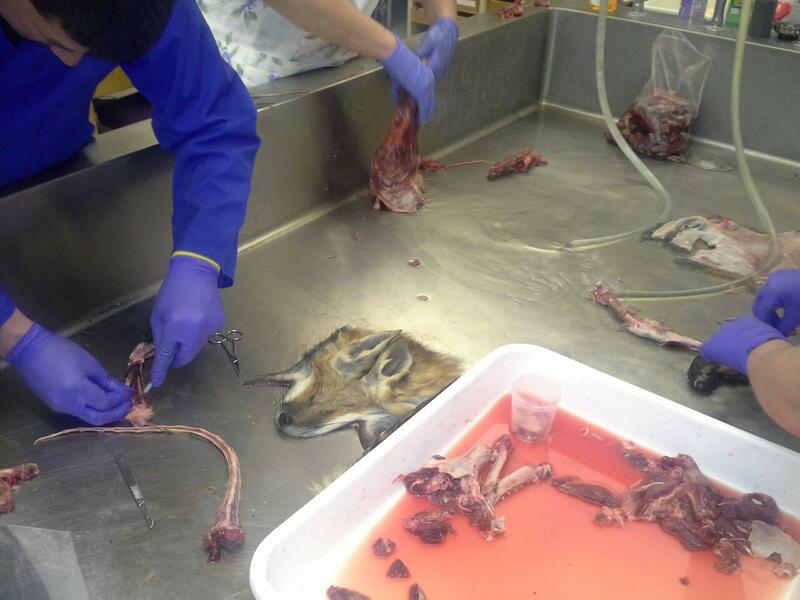 You maintain the simmer for as many hours as possible at a time, until the specimen is disarticulated and clean. At home I use a big pot (originally intended for crab) and my kitchen stove. At school, I use large beakers on hot plates under a fume hood. Again, depending on species, this can take a long time (for some reason, birds seem to take the longest time for me), but this is by far one of the fastest methods. Adding a small amount of detergent such as Biz, and a smidge of bleach, will help. Be aware, though, that the heat may slightly warp or shrink the bones. And if you accidentally let it come to a full boil (as I have), it will cause the cortex to flake and peel once it’s dry. I have a flaky black bear in my collection, and handling it always creates a horrible mess. The use of “bug boxes” filled with flesh-eating beetles (Dermestes sp.) seems to be most common in museums. Although the beetles only eat dead flesh (so you don’ t have to worry about being attacked a la The Mummy), I personally hate them. Not only do the beetles themselves smell disgusting and produce a ridiculous amount of waste and dandruff (including larval hairs) that some people develop allergies to, they don’t completely clean the bone. The beetles like to eat flesh, not tendons, which means that there are often little nubbins of tendon left at the insertion points around the joints. (This explains why the Zoology Department interns at The Field Museum are called “Pickers”… when I was there they spent a large portion of their time picking whatever the dermestids didn’t eat off of the bones). Now, for biologists this might not be such a bad thing, but for zooarchaeologists one of the major things we look at on a skeletal element are the articular facets! I’ve looked at many osteological specimens at many museums, and found that most of them were worthless to me. Very irritating. Also, you have to buy these suckers from specialized dealers – anywhere from 300 to 1,000 adult beetles at a time. And remember, in order to maintain a colony you have to keep feeding them carcasses, otherwise they’ll starve to death. Depending on the size of your operation, this can be problematic. Manure (herbivore only!!!) 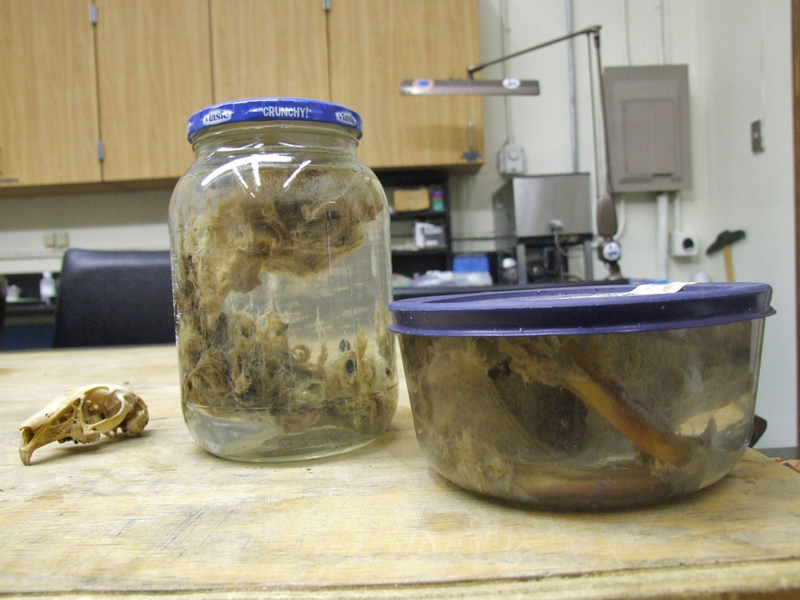 is a wonderful way to process animal specimens. It is the preferred method of the Alaska Consortium of Zooarchaeologists (headquartered in Anchorage, Alaska). We usually get horse manure from one of the local barns, but we’ve also picked up camel manure from the zoo. Any herbivore should work well, and people are usually very willing (if surprised) to give away poo. It works similarly to cold water maceration in that you dump the carcass in a tub of some kind (preferably wrapped in window screen to make it easier to find all of the elements once the specimen is done processing), cover it with manure, throw a lid on it, and walk away. Unlike maceration you don’t have to change out the water or tend to it, but you do have to do more work once the manure has worked its magic. Cleaning poo off of the bones takes time, and no one likes working with feces (even though at this point, if everything has gone well, it just smells like dirt). It usually takes a few months for the little microbes and things in the poo to get the specimen clean (again, depending on size and species… It took my porcupine 6 months). Another thing to keep in mind is climate – manure works well in cooler temperatures (I’m assuming you’ll be keeping the tub outside somewhere). It’s okay to overwinter it outside, although you’ll probably need to add some fresh manure come spring. In California, it seems like manure doesn’t work as well – It gets too hot, and the tiny critters we want end up dead while the flies breed like mad. This is a new technique for me – I first heard about it from Michael Etnier (http://www.appliedosteology.com/). After the manure method wasn’t working out so well for our Anthropology Department here in California, a bunch of us got together (funded by the UCD Zooarchaeology Lab) and built a large, above-ground sandbox in my back yard. 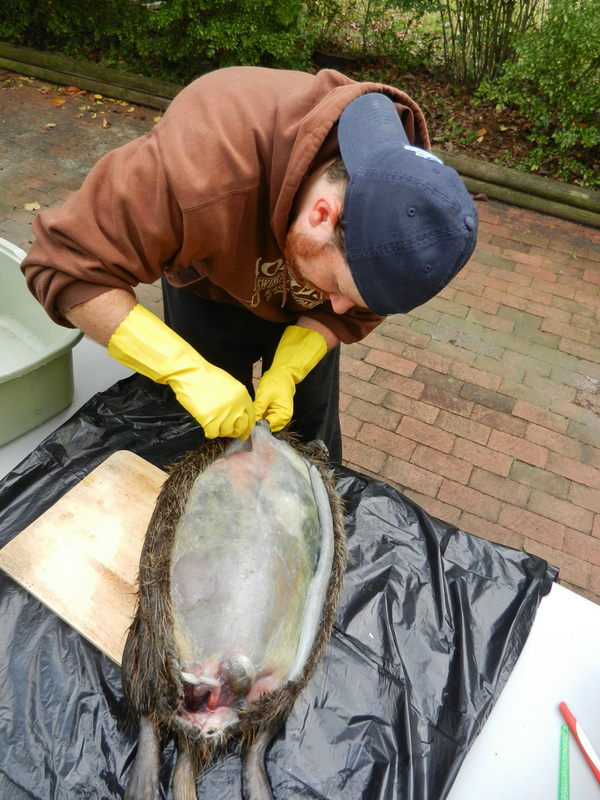 Following the same principle as before (wrap it in window screen, cover it, walk away), we finished processing two sea lions and a goat that had been languishing in hot, fly-infested manure, and are just about ready to pull out a harbor seal and a cow head. The sterile sand facilitates autolysis, which basically means that the enzymes in the carcass devour the tissue. It’s been working very well so far, although my poor husband did have to water the sandbox for me over the field season, as the specimens were beginning to bake instead of melt. Apparently you don’t have to do that in the Pacific Northwest. If you go for the sandbox method, just keep your local weather conditions in mind. 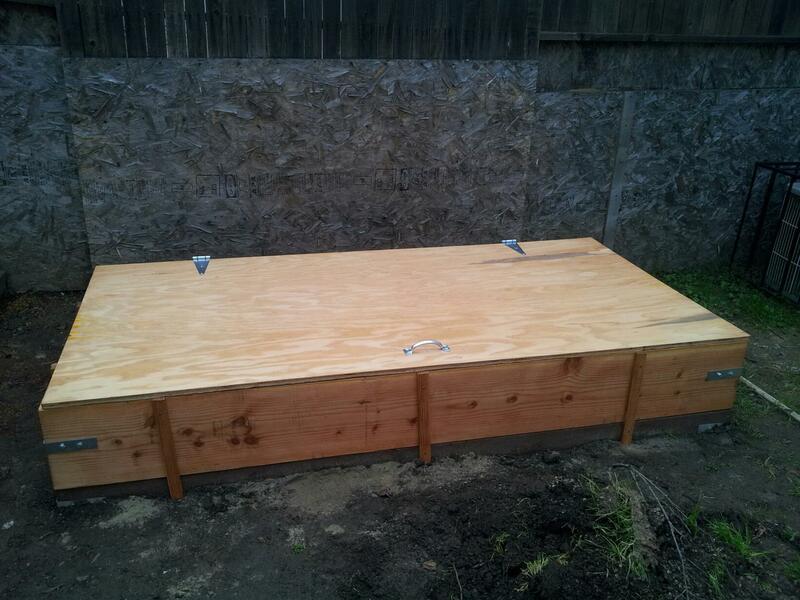 My sandbox – the cover keeps the feral cats from using it as a litter box. A fantastic resource for specimen processing is Lee Post’s Bone Builder’s Notebook (http://theboneman.com/). Based out of Homer, Alaska, Lee is a self-described “bone builder”, well-known for his incredibly useful hand-drawn osteology books and innumerable projects articulating skeletal specimens for schools and museums. He just revised the book this year, so it’s as up to date as you could hope for. Another good resource is the blog of Jana Miller (http://bone-lust.blogspot.com/), who writes about skeletal processing from a naturalist and artist’s perspective. Hello everyone! Classes start up tomorrow, and I’ve promised myself that I’m going to do a better job at blogging regularly than I have in the past. That said, I expect many of them to be along the lines of this post – brief musings not about any specific zooarchaeological topic (although I do still have plans to discuss marine reservoir corrections, stable isotopes, and ethnobiology!). Zooarchaeology is a varied and time-consuming field. It includes excavating thousand-year-old (or, for one of my friends, 50,000-year-old) materials, cleaning it, and spending hours in a (usually windowless) lab sorting it. It also includes searching the beaches for bloated seal corpses, nagging friends for their kills (“Why can’t you pack out the entire caribou skeleton? I need the vertebrae!”), and excitedly pulling the car over when you spot a freshly-hit porcupine (much to your husband’s dismay). Although by far my least favorite part of the job, finding and processing comparative specimens is incredibly important. Where would we be without them? I’ve just finished cleaning and labeling the lovely comparatives I acquired in the field this summer (thankfully all found in late stages of decomposition), and can now turn my attention to the three archaeofaunal assemblages waiting to be analyzed. Site locations: St. Paul Island, Cape Espenberg, and Cape Denbigh, Alaska. Unfortunately I only helped excavate one of these sites – something that I’m beginning to realize is quite common for zooarchaeologists. It appears that there is a back log of faunal remains waiting to be analyzed, and not a whole lot of people chomping at the bit to do so. Probably because most of us get into this profession for the field work, not the lab work. I do, however, think that lab work is easier for those of us working in the Arctic – we’re forced indoors during the winter! Here in California the archaeologists can work year-round; their will power is greater than mine. Hats off to those archaeologists who choose to do lab work while the ground is temptingly unfrozen and visible! I had to share my new tattoo with everyone – I’m so in love with it! Thank you to James Allen of Anchorage Tattoo Studio for the beautiful work! Dena’ina Ethnoornithology: I want more! New York -> Guatemala -> ? I'm passionate about something, I'm just not sure what it is yet.